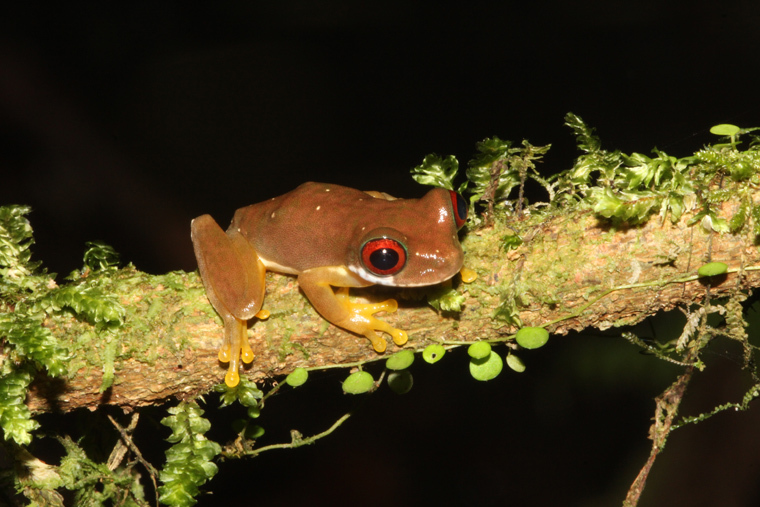 This evening we were going to concentrate on Brian’s specialty – glass frogs. 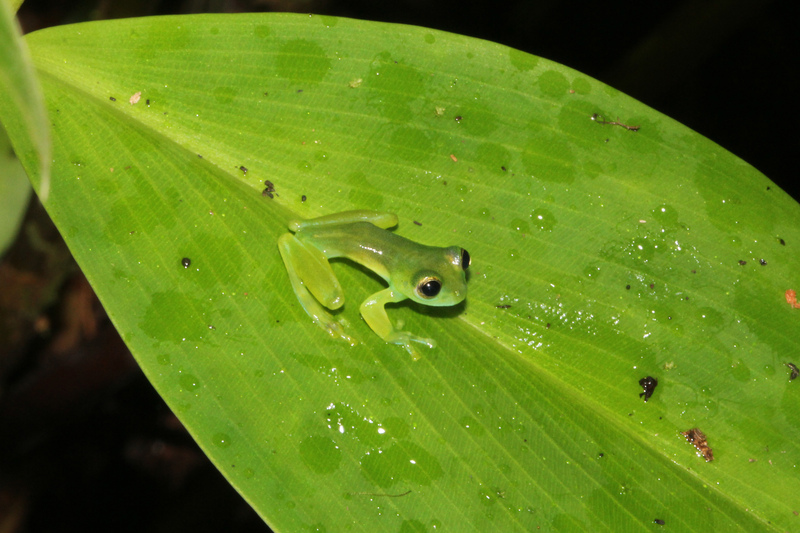 Unlike the leaf frogs, glass frogs are found near streams and rivers, which meant a steep and somewhat slippery hike down to the Siquirres River. Actually the trail was pretty good; Brian had built three miles worth of trails over the years to better explore his reserve. 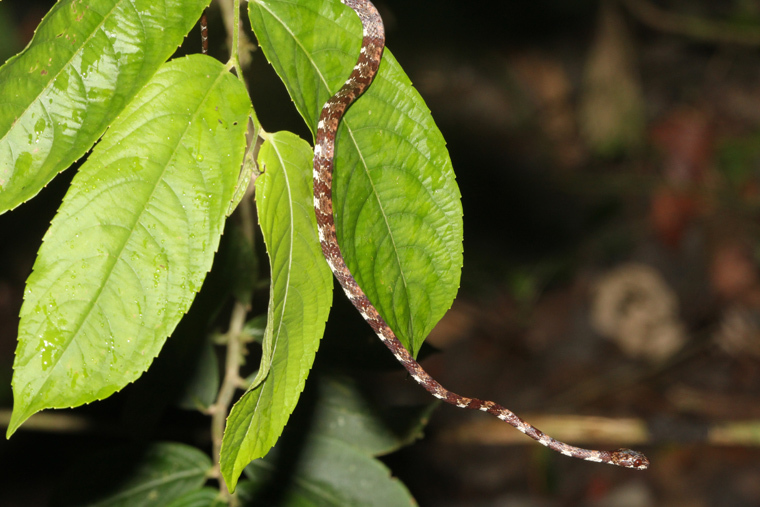 The first thing we saw was another (or the same) Fer-de-lance, almost in the exact same location as the previous night. 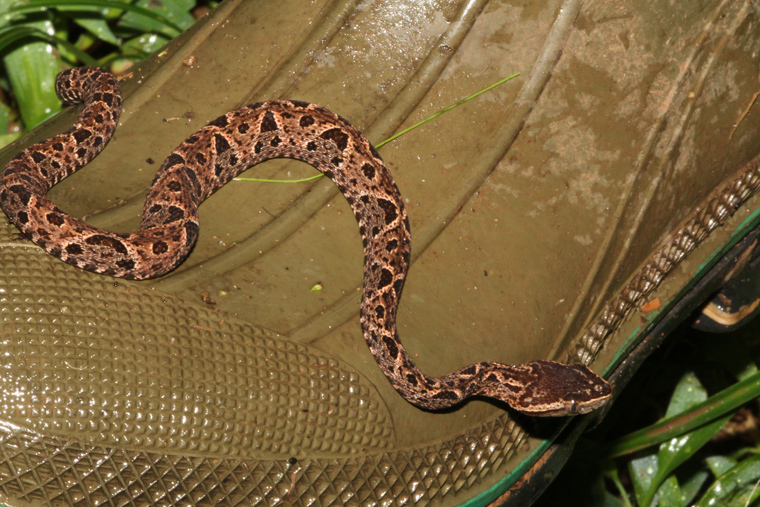 This one slithered right over Brian’s rubber boot. Yeah, I was glad I’d brought a pair of rubber boots on the trip even though they were heavy. You just never know when you’ll need an emergency snake protector. We hiked down to the river and spent the next two hours wading in a mountain river, scrambling from rock to rock, and one sand bar to another. When my brother-in-law Phil said I was going “deep into Costa Rica” I hadn’t realized he was talking literally! 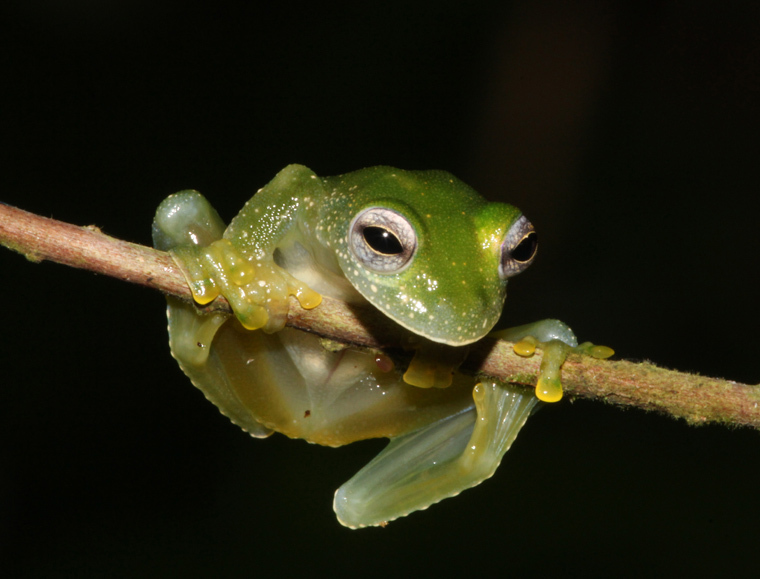 One of the first frogs that we located was this cute tree frog. 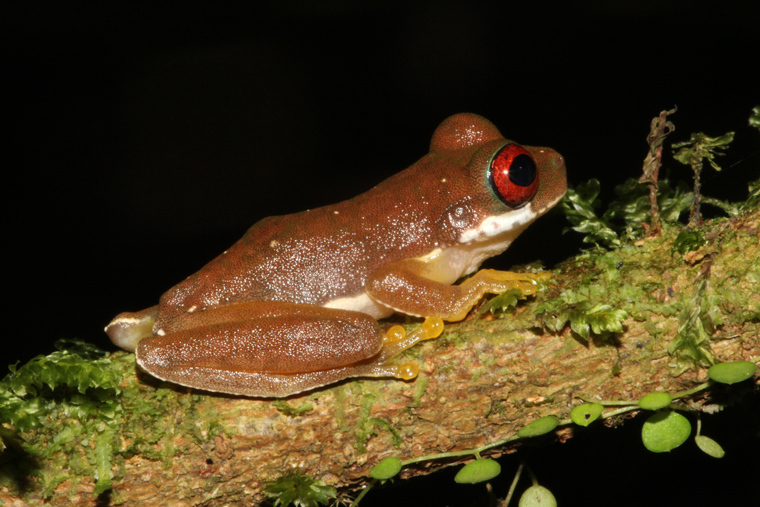 Duellmanohyla rufioculis lives in premontane wet forest and rainforest. A nocturnal stream breeder, males call throughout the year but are most active from August to December. Fortunately, this little beauty is still regularly encountered in suitable habitat throughout its range and may be resistant to the chytridiomycosis fungus. While I was busy photographing and trying to keep from falling into the river, Brian found this snail eater in a tree. 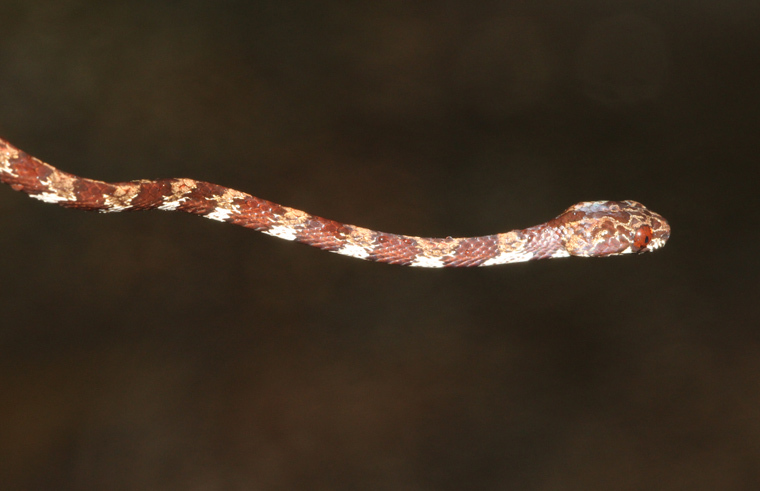 Red-ringed Snaileater (Sibon annulatus) along the Siquirres River. 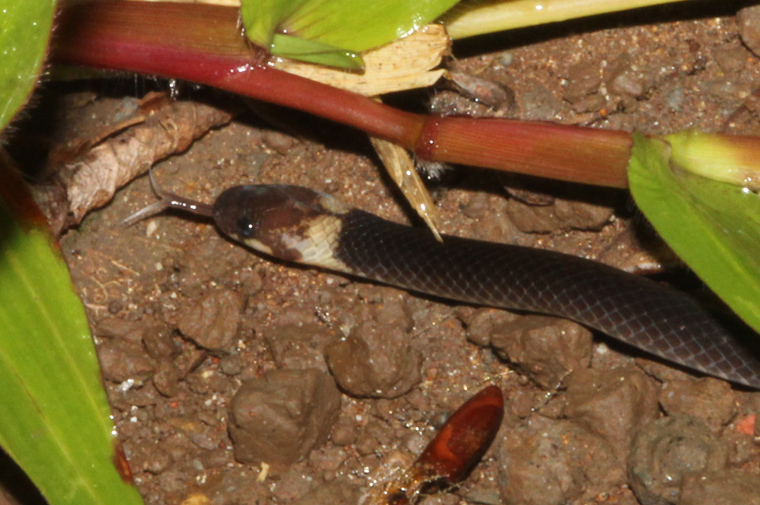 Sibon species are harmless snakes that specialize in hunting and eating snails and slugs. They have a special jaw adaptation that help extract snails from their protective shell. 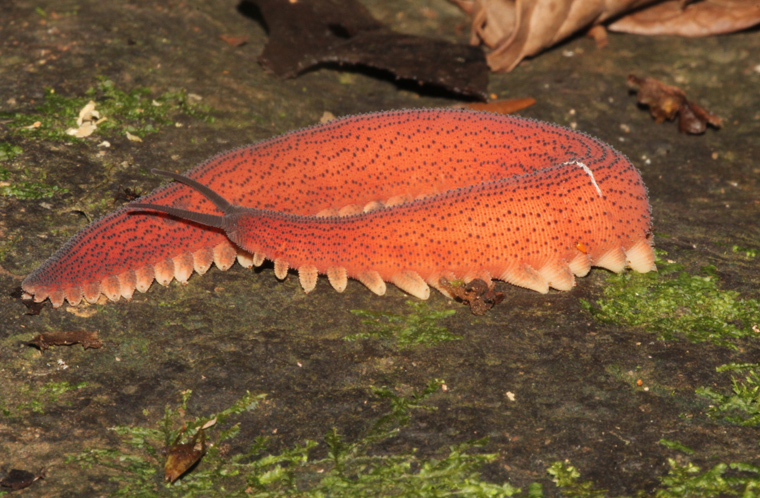 One of the most bizarre and colorful things that I saw at CRARC was this velvet worm. 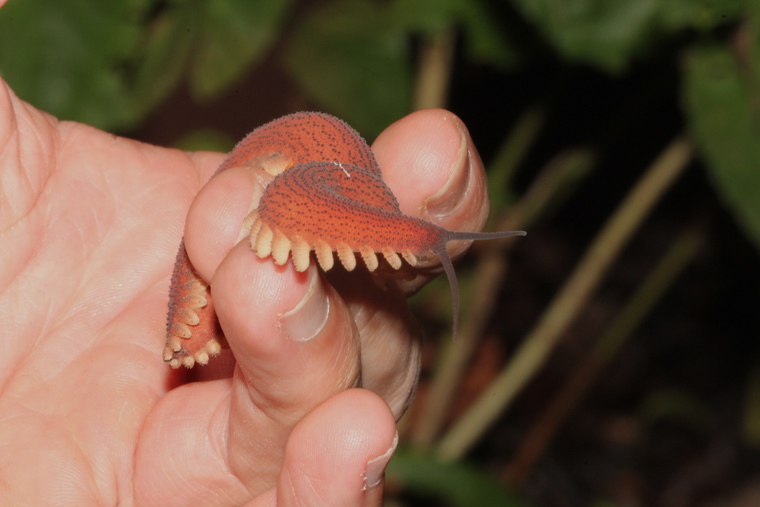 Velvet worms are so unique that they belong to a phylum of their own, the Onychophora, meaning ‘claw-bearers’. They are terrestrial worms that look rather like caterpillars. Notice the antennae and clawed legs down the whole length of its body. They give birth to live young!! 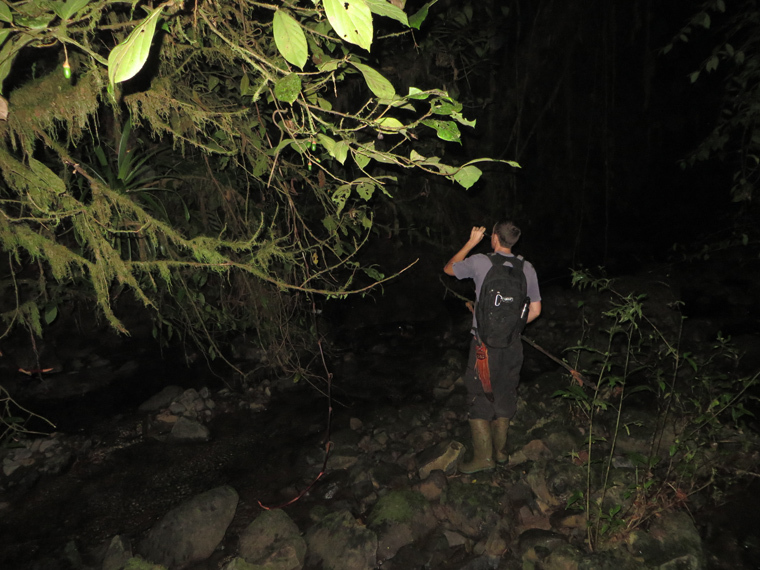 Soon after this find, Brian was successful in tracking down our first glass frog of the night. 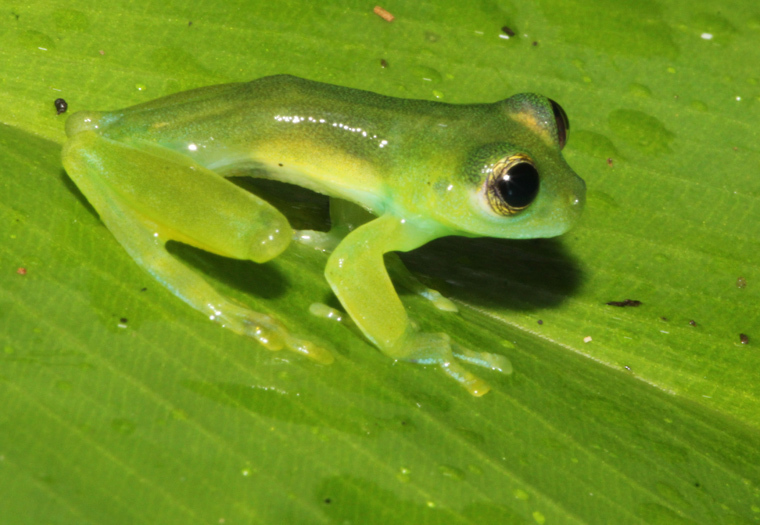 The Dwarf Glass Frog (Teratohyla spinosa) is one of eight species of glass frogs that breed on the reserve. Soon after, Brian located a Powdered Glass Frog (Teratohyla pulverata) which was elegant in its own way. This was an amazing evening. The hours passed by quickly and before I knew it it was time to return to home base. 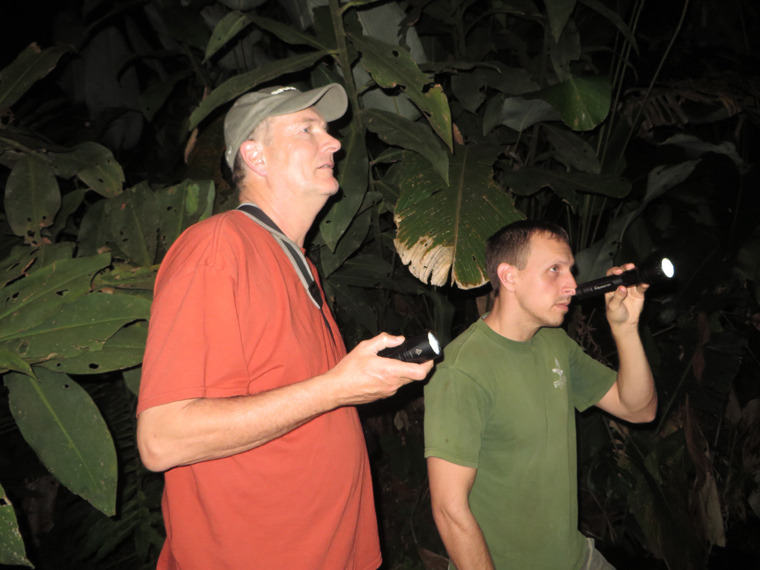 Brian Kubicki and John Vanderpoel searching for frogs at the Costa Rican Amphibian Research Center. But on the return hike we had one more adventure. A small snake crawled across the path in front of us. 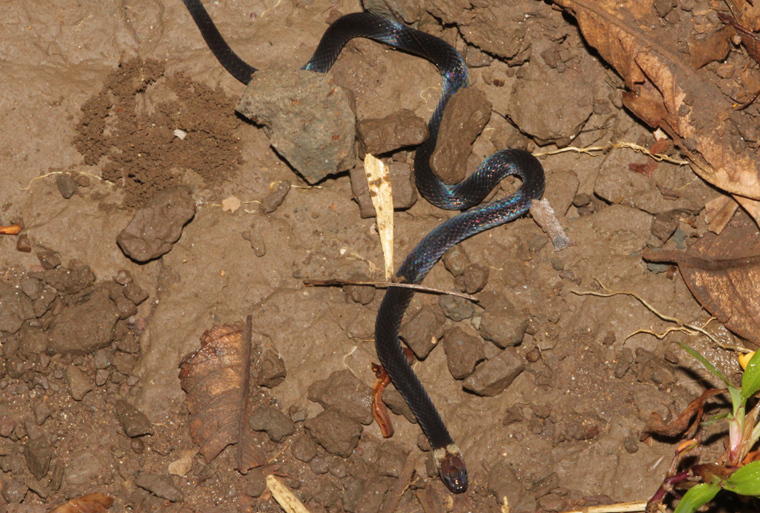 I believe it’s one of the Tantilla species (seven are found in Costa Rica) and will try to get a definitive identification. Here’s a close-up of the head pattern.